Former Taxiride frontman, Jason Singh has embarked upon the biggest step in his career to date, releasing his highly-anticipated first solo album, titled 'Humannequin", to be launched with an electrifying live show at The Toff In Town on Wednesday, December 4th, 2013. Taxiride fans will be treated to their favourite hits, as they discover the renowned, Melbourne-based singer/songwriter's brand new material on his solo debut. 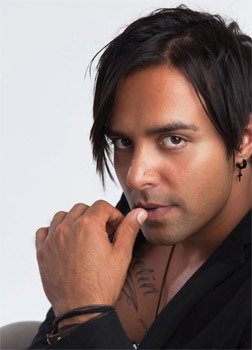 Produced by the legendary, ARIA-Award winning Charles Fisher, whose studio pedigree boasts such success stories as Savage Garden, Air Supply, Hoodoo Gurus, Ace of Base and Olivia Newton-John (to name a few), 'Humannequin" drips with impossibly catchy pop, showcasing Singh's flawless vocals and songwriting prowess to a tee. 'Hold On Forever" is the first single off the album, and has already been picked up by commercial/regional radio stations across the country, as well as being selected as the feature song of Seven Network's on air promos for Million Dollar Minute. As the frontman of Australia's beloved Taxiride, Jason has had extraordinary success. Taxiride became a hit sensation in the early 2000s, and found national success with Top 5 ARIA platinum selling albums and six Top 40 ARIA singles. Jason has toured extensively throughout his career, including international tours in North America, Europe and Asia with Taxiride. As a solo artist, he has had two Top 10 ARIA club hits, 'The World As You Know It" and 'One World". Question: How would you describe Hold On Forever? Jason Singh: I'd describe it as a positive and uplifting song about taking a chance and running away with someone you love. Question: How does it feel to hear your song on television? Jason Singh: It still feels a little strange, almost like a shock when it comes on. Makes me stop whatever I'm doing. Question: What inspired you to begin a solo career? Jason Singh: I learnt how to play music on my own. I always listened to music on my own, so it was always bound to happen. All my favourite artists are solo artists so it was just time to see what I sounded like alone. Jason Singh: Yes I do, I write songs about real things that happen to me or to people around me. All my songs are stories about me or my friends. Jason Singh: It depends on what I'm doing. if I'm in my car I'll listen to mainly pop music but if I'm in the gym it has to be hard rock like Rage Against The Machine. But my biggest influence has to be Prince. Jason Singh: All of the above. Humannequin is out, so now it's about getting out and bringing the music to the people. Jason Singh: Not yet. I mean I'm up and down like anyone else but I think I'm just getting good at making music so hopefully the best is yet to come. Jason Singh: I like both but, right now I've just been writing and recording for a while so the fire is there to hit the stage now. Jason Singh: The same reason as most musicians - girls. No, I love the fact that I can make people feel good with music. It's very addictive. Jason Singh: Staying relevant and to be able to change with the times. Jason Singh: I have two young children, so most of my day is taken up with them. On a typical day, I get up, drink two coffees before putting pants on, then go to the gym and then spend some time in the studio, going to the park and being a professional swing pusher. Then coming home and trying to get my kids to eat something besides nuggets and chips, bath time, teeth time then when all that's done, grabbing a guitar and watching some 'man TV" on A & E. Phew. I'm tires just saying that! Jason Singh: Hearing my two year old saying that he wants to be a rock star like dad when he grows up. That and the immediate connection with whoever is listening. Jason Singh: I have collaborated with some amazing artists from Graham Goulburn of 10cc, all the way to Snoop Dogg, but if had a dream to achieve before I go, it's collaborating with PRINCE. Jason Singh: I hope you love listening to HUMANNEQUIN as much as I loved making it and thanks for following me on the journey.